We describe an extremely rare combination of TOF associated with a right aortic arch with a mirror-image branching, and a persistent hypoglossal artery. A 2-year-old boy was admitted at our radiological department with visual impairment after being submitted to an elective surgical repair with Goretex graft interposed between the pulmonary artery and the brachiocephalic trunk. He was diagnosed with TOF at 25 gestational weeks and undergone surgical repair at day 7 of life. The deletion 22q11 was negative. His daily activity and neurological development were fair, but he presented with hypotonia and was speechless. 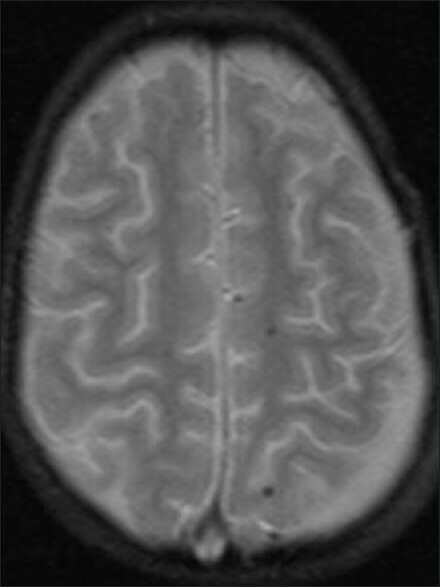 Brain magnetic resonance imaging (MRI) showed small dot-like lesions supra- and infratentorial with hyposignal on T2 gradient eco-weighted images [Figure 1] suggesting microbleeds due to microemboli. 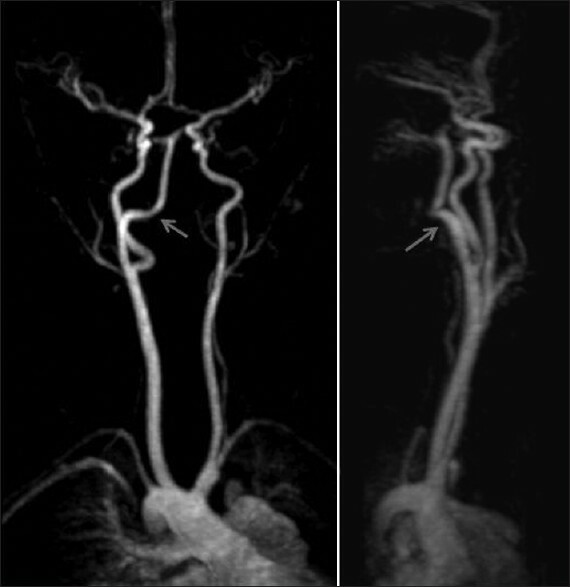 Contrast enhanced MRA demonstrated a right aortic arch with mirror-image branching and an anomalous vessel arising from the right internal carotid at the C2-C3 level and leading to the basilar artery [Figure 2]. 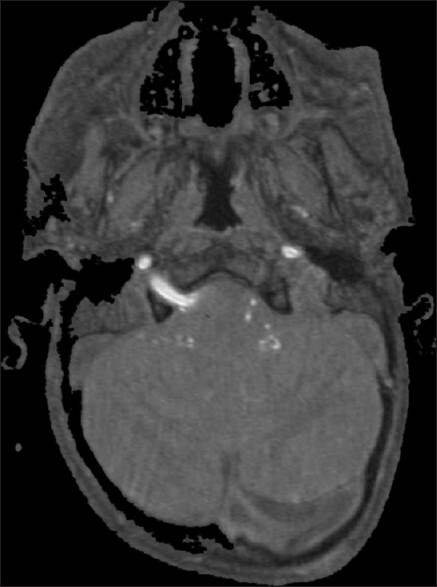 Imaging of the time of flights revealed that this vessel entered the skull through the hypoglossal canal [Figure 3]. Bilateral vertebral arteries were hypoplastic, but the right posterior communicating artery was present. The patient condition slowly improved, and was discharged from the hospital with regular follow-ups at our pediatric cardiology department. Neurological and developmental deficits are common in children with congenital heart disease due to multiple factors that include the etiology of the congenital heart disease, the effects of abnormal cardiovascular function, and the possible sequelae of open-heart surgery. Perioperative neurological complications include diffuse hypoxic-ischemic injury, cerebral hemorrhage, focal infarction due to macroemboli, but a leading cause of neurocognitive defects associated with open cardiac surgery is the production and circulation of microemboli. The major types of microemboli are gas emboli, foreign material, and emboli generated from blood elements. With the exception of atrial septal defect previously described in two case reports, , however, anomalies of the heart and aortic arch vessels in combination with PHA have never been reported. Our case, which illustrates the coexistence of a TOF and PHA, is to our knowledge the first reported case in the English language literature. The coexistence of these vascular anomalies in the patient raises the question of a common etiologic factor or factors in their pathogenesis. One possible explanation for the persistent hypoglossal artery being frequently associated with hypoplastic vertebral arteries is the less need of vertebral arteries to supply the posterior circulation and the brainstem. It is difficult to relate the TOF and the right aortic arch associated with mirror-image branching with a persistent hypoglossal artery, but we can presume a common embryonic insult at the 3-10 mm fetal stage. 1. Baltsavias GM, Chourmouzi D, Tasianas N, Drevelengas A, Damianovski D, Jovkovski S. Ruptured aneurysm of a persistent primitive hypoglossal artery (PHA) treated by endovascular approach-Case report and literature review. Surg Neurol 2007;68:338-43. 2. Meguro T, Terada K, Hirotsune N, Nishino S, Asano T. Unusual variant of persistent primitive hypoglossal artery. Br J Radiol 2007;80: e314-6. 3. Frank L, Dillman JR, Parish V, Mueller GC, Kazerooni EA, Bell A, et al. Cardiovascular MR imaging of conotruncal anomalies. RadioGraphics 2010;30:1069-94. 4. Miller G, Vogel H. Structural evidence of injury or malformation in the brains of children with congenital heart disease. Semin Pediatr Neurol 1999;6:20-6. 5. Lee EJ, Chang HW, Cho CH, Kim E, Lee SK, Kwon JH. Rare variant of persistent primitive hypoglossal artery in magnetic resonance angiography. Surg Radiol Anat 2010;32:801-4. 6. Chang HK, Wang JN, Hung WP, Chen SJ, Wu JM. Tetralogy of Fallot associated with right arch and persistent left dorsal aortic aneurysm. Int J Cardiol 2011;149: e53-4. 7. Higashikuni Y, Nagashima T, Ishizaka N, Kinugawa K, Hirata Y, Nagai R. Right aortic arch with mirror image branching and vascular ring. Int J Cardiol 2008;130: e53-5. 9. Matsui H, Udaka F, Kubori T, Oda M, Nishinaka K, Kameyama M. Persistent primitive hypoglossal artery with atrial septal defect. Intern Med 2005;44:507-8.